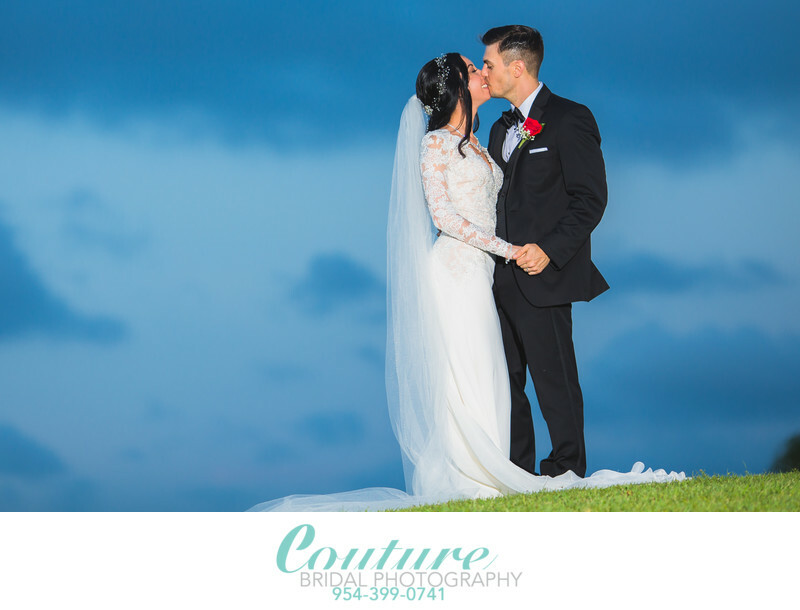 5 Tips for Choosing the Perfect Wedding Miami Beach Wedding Photographer! Do you need help deciding on the perfect wedding photographer? With all the amazing photographers in South Florida, I can understand the challenge! I am excited to help guide you through the process of choosing the perfect wedding photographer for your Wedding! I know it can be self defeating but I am an artist first, a business man 2nd. As an artist I understand art is subjective and although my unique and distinct style has brought me success and acknowledgement as one of the “Top 3 Wedding Photographers in Fort Lauderdale by ThreeBestRated.com “and among the “Top 20 in Fort Lauderdale/South Florida by expertise.com 2 years in a row, along with Weddingwire’s Couples Choice Awards for 2016, 2017, 2018 and The Knots Best of Weddings for 2017 and 2018, I’m not every bride and grooms cup of tea. Although, I can adapt and change up my style a bit to fit most couples taste, as an artist I can only veer for far from what comes inherently to me. This brings me to another philosophy of mine. I don’t do paid advertising and I never have. I use the Knot & Wedding wire for reviews and utilize their free accounts. I use “Search Engine Optimization” so my website shows prominently and organically in online searches and social media to let people I know I exist. I also have a great repertoire with a lot of Wedding Venues, Hotels and planners, who constantly refer me to all their clients. Since 2008, I have taken an organic approach to building relationships with planners and Event/Catering Managers. Most Wedding Photographers chase planners and event/catering managers to get on various wedding vendor lists. They want to get listed among 10, 15 and even 20 other wedding vendors, which I believe causes people to call each one and pick the least expensive offer. My approach to being an artist first and not asking to be on “Preferred Vendors Lists” has benefited me. These Wedding Planners/Catering managers, etc. will hand an inquiring bride and groom a “Preferred Vendors List”, but give them my card. What stands out more? Couture Bridal Photography listed among 20 other Wedding Photography Studios or a Couture Bridal Photography business card handed to you! It speak volumes and with the amount of weddings I photograph in South Florida, across the country and Puerto Rico, it shows. Let’s begin with my 5 tips on finding the perfect wedding photographer for your big day! I hope its me, regardless of where you are because I like to travel and offer some incredible deals for destination weddings whether it’s yours or mine (going to you) for a change of pace and surroundings. One big thing to remember when hiring a Wedding Photographer is, there are no do overs!!!! The one aspect of your wedding you can't take chances with or try to cut corners with is Wedding Photography. It’s the only thing you get to keep to relive your wedding day! 1. Define the style of photography you love! 2. Ensure the photographer’s personality meshes well with yours. 3. Identify the level of wedding photography experience/education/expertise you require. 4. Research what previous couples, parents and friends have said. 5. Rate your photography choices on a scale of 1-10 to help you narrow down your choices and options. 1. Define the style of wedding photography you love! As a professional wedding photographer, I can look at any wedding photo and immediately recognize the style of the photographer, but I realize some brides struggle with defining what style they like and are looking for. •Classic/Timeless/Elegant – Photographs that are clean, styled, and well posed that are meant for preservation, as a timeless heirloom that will be classically beautiful when you’re 90 years old. This is predominantly my wedding photography style! Colors are natural and there is minimal Photoshop editing is needed. Yet my color toning and editing style are based on classic film used in the past. The majority of brides, grooms and their family love my style which covers a bit of each of the following styles. •Artistic/Creative/Fine Art – These images are sometimes edited a bit more and can be moody or have extensive textures and tones. Some may be black & white process that I specifically created based on a classing black and white film emulation. Other images might have vibrant tones and blurring to draw your eye to the subject in the image. •Wedding Photojournalism – Capturing your wedding day details, emotions and fleeting moments as they take place. For the most part, the wedding ceremony is 100% photojournalism along with the reception. Sometimes during the getting ready or during the bridal portrait session, I set the stage for moments to naturally take place. •Wedding Editorial Photography - Photography that is highly posed, artificial lighting is used and the subject or subjects are made to stand out and be glamourous. The best example would be a fashion magazine, but with highly thought compositions, textures and lighting. This is a key aspect of some of my bridal portraits during an engagement session or during the wedding day. Key Point – An experienced wedding photographer should be skilled enough to cover a variety of styles, and have the experience and knowledge to work in low light or mixed lighting situations. They should also have the professional level cameras and lenses to work in any weather conditions, lighting conditions and sometimes temperate conditions. They should create engaging story telling portraits and be able to pose a family/wedding party photo of 40 people in just a few minutes. 2. Personality is SO important! Do you think you’d get along with the photographer? After photographing over 300 weddings and even more engagement photography sessions in the past 8 years, I’ve come to the realizations that I spend more time with the bride and groom than any other vendor. Most of my brides and grooms communicated with me about their upcoming wedding than even their wedding planner and sometimes family! Find the right Wedding Photographer also involves liking their personality and how you get along. You can love a wedding photographers website and love their “About Me” page, but getting along in person and spending 8 to 10 hours with them is a completely different story. I’m a complete extrovert, and most people find me fun and friendly. I’m really lucky in that I can read people and I quickly adapt to how their personalities work, additionally, being a cop for 10 years then a Firefighter/Paramedic I have a firm grasp of cultural diversity. I also happen to be very lucky that most people like me, so they quickly become very comfortable with me. Key Point: If you have any reservations about being yourself around your photographer or just don’t connect on a personality level, then keep looking. Your Wedding Photos aren't going to be all they can be if you can connect and there’s any kind of animosity or lack of comfort. You will have to work with your Wedding Photographer throughout the day for the whole day and if your personalities clash, you'll be miserable, he or she will be miserable and the end result will be dull Wedding photos!!! 3. Identify Their Expertise Through Experience, Education & Equipment. 1. Experience: How long have they been involved in photography? How long have they been photographing weddings? How many weddings have they photographed alone or as a second shooter? Being a wedding photographer, starts with a strong foundation in photography. You will find 95% of “About Me” pages tell a sweet story about discovering photography as a child and falling in love with taking pictures and yada, yada, yada…. There’s thousands of Wedding Photography business started every Christmas day with consumer Canon and Nikon cameras with kit lenses included every year. The cold hard truth about Wedding Photography is that it’s the only type of commercial photography that brings some sort of income. People get these nice camera’s that look a lot like professional models and go out learning as they photograph peoples weddings. Most don’t really know about lighting or have the appropriate equipment and software to properly edited digital images. Worse they are working on small laptops without any backups and can lose every image. As a rule of thumb, any “Professional Wedding Photographer” offering Wedding Photography anywhere in the United States for under $1,500.00 should be suspect. A professional Wedding Photographer showing up to provide Wedding Photographer services for 8 hours will be arriving with about $10,000 in Equipment, there is no way they can support a truly professional Wedding Photography Studio or business photographing weddings for less than $1,500.00 a wedding. At $1,500 a wedding they would still be struggling to make a Wedding Photography business model work. 2. Education: I’m not talking about a bachelors or any kind of college degree in photography, but it does help to know if your professional Wedding Photographer has any specific training, past experience of is familiar with some of the top wedding photographers in the world. A degree photography isn't a degree, I would recommend to any of my loved ones, but I would want them to have had some kind of foundation in photography. I am a self taught photographer, but I started years ago and took some classes in high school and college as electives. I followed that up with magazines, reading and experimentation over a period of over 20 years. Later in life, I attended photography seminars and camps hosted by some of the worlds top professional photographers. I also spend a lot of time reading new literature, attending webinars, and still attend seminars and conferences to always be in tune with the latest trends, approaches and techniques. As an example, I was shooting a wedding in December 2017 and during the ceremony the camera I was using suffered a severe malfunction. I couldn't adjust the shutter speed because the button wouldn't work. I immediately, knew to use the menu system in my camera to change and adjust it manually through the back screen on my camera vs. using the button on my camera. I had another camera available, but a wedding ceremony happens fast and I didn't want to miss anything. I ended up getting some amazing photos even with such a big problem. After I wondered to myself, had this couple hired a less experienced photographer from a Facebook group or off of craigslist, they would have been missing a significant number of images and the couples wedding photography would end for the day! You also want a wedding photographer who is willing to guide you throughout your wedding photography experience from beginning to end and who communicate efficiently with you throughout the process. Does your photographer have a system in place for when and how you’ll view your images and sets expectations ahead of time? Every experiencedprofessional photographer knows exactly how long it takes to get your wedding collection edited and delivered. Your wedding Photography should also have a system of delivering your wedding pictures. HINT: If your wedding photographers in using Dropbox to deliver your wedding photos, DVD’s, CD’s or any kind of file transfer service other than a professional password protected online photo gallery for delivery, you should be questioning their professionalism and probably continue your search. Your wedding photographer should also show you an example of a wedding gallery and explain to you how you share it, if allowed and how you download or choose your wedding images. It’s their job to educate you on the Wedding Photography process and manage your expectations so that everyone is happy and you’re not waiting 6 months waiting to see your wedding photos. 3. Equipment: A professional Wedding Photographer will be should be equipped to photograph your wedding day under any and all conditions. They should have high-end cameras, lenses and lighting equipment that is reliable, in good condition, and well maintained. They should also have a backup. I personally show up to every wedding with at least 2 camera’s in my possession and a variety of lenses that cover each other in case of a failure. Some wedding reception venues and houses of worship my not be well lit. Not having a high performance camera and lenses will result in very bad images or blurring will occur if a camera has to have a very low shutter speed to let enough light in to get an image. If the camera doesn't perform well in low light or lenses don’t have a wide constant aperture, I can assure you disappointment with this images. Another consideration during a wedding, is weather. I don’t make it a habit to photograph a wedding while it’s raining, but I know my high-end Canon Camera’s and Canon Lenses won’t be harmed by rainfall and I won't miss a beat should the weather turn bad. I also know I can photograph a ceremony and reception in low light and achieve perfectly exposed images with very little noise. I also have a variety of multiple flashes, video lights, strobes and lighting tools for any and all lighting conditions. I even carry filters for my flashes to match the predominant light sources I might encounter to keep whites looking white whether the light sources is warm and orange or as with fluorescent lighting green! Your wedding photographer should have backup equipment and a plan B, C and D should you have have terrible weather on your wedding day. If you live in the South Florida, you would understand how much it rains and how quickly it can go from clear blue skies to dark black thunderstorms. A great way to measure a Wedding Photographers past performance are reviews. Although many Wedding Photographers game the system by having friends review them or join online social media groups to trade reviews, this is a good way to see what others have thought about the wedding photographer you are considering. One way to spot fake reviews is to look for when your wedding photographer established their business or subscribed. Keep in mind there are 365 days in a year and 52 weeks in the year. That gives you 52 Fridays, Saturdays, and Sundays. I will toss in Thursdays, since this is a popular wedding day for orthodox Jews who observe sabbath. I personally on my own photography about 60 weddings a year and at the beginning in 2008 about 15-20 weddings. For some reason, it is actually difficult to get reviews from couples, because I personally don’t request them, although I do hint at it. In 8 years I have reviewed just over 70 reviews on weddingwire.com and knot.com, I would be skeptical of anyone with more than 50 reviews per year even under the best circumstances. Look for independent publications and review sites likeThreeBestRated.com and expertise.com. They are independent review companies who use proprietary metrics from across the internet to review difference businesses and based on my own research are pretty accurate with the businesses they recognize and Highlight. Another question to ask is professional memberships. I am a member of the PPA (Professional Photographers of America) and I was invited to join FearlessPhotographers.com, which photographers have to either apply to or be invited to join and is strictly based on the Skill, Artistry, Composition and Proficiency in Wedding Photography. Take a look at their Website. What do you think of the images? Do they speak to you? Also is the website only best of images, or are there complete galleries that show a complete wedding day? My website has a mix of images to show variety, but I also have a “RECENT WEDDINGS” tab that has images that represent complete wedding days under various conditions at a variety of venues in various states and countries, since I photograph many Destination Weddings. 5. How much do you want to work with a certain photographer? Does their work make you smile? Are you excited or love what you are seeing on a Wedding Photographers website. Most Professional Wedding Photographers who are passionate about their work want couples who value their work, their style and are excited to have them capture their Wedding day. My photography happens to resonate with a wide variety of couples from a wide demographic. This is why couples fly me as far as Los Angeles, New York City, Texas, Puerto Rico and now in 2019 Italy to photograph their wedding. They love my style, they see I am genuinely passionate about wedding photography and they see I offer more than just photography. I offer a wedding photography experience that is catered to each couples specific needs and vision. I am also flexible, because my style of photography and my approach isn't rigidly confined to a specific “STYLE”. Congratulations on your upcoming wedding day! I sincerely hope this article enlightens you and most importantly helps you find the best wedding photographer for your wedding day. Please feel free to peruse my website and take advantage of some free downloads I am offering. Click the links and download what you need. Location: 4441 Collins Ave, Miami Beach, FL 33140.